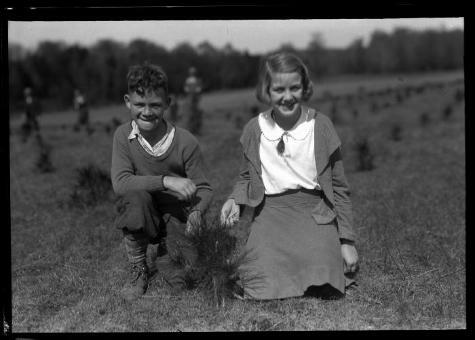 Miss Frances Brenning Paul Stewart, Trenton, N.Y.
A young girl, identified as Miss Frances Brenning Paul Stewart, and an unidentified boy pose with a newly planted pine seedling. The children are on a tour of reforestation areas with their parents that is passing through Trenton, New York. This image was created to document the reforestation tours of the Adirondacks, begun in 1924 by the New York State Conservation Department. Source: New York State Archives, New York (State). Conservation Dept. Photographic prints and negatives, [ca. 1904-1949], 14297-87_3565.